Tonnage:	Gross: 16 Net: 11'97"
Saunterer is a classic yacht built by Charles Sibbick in 1900, is based in the United Kingdom, and still in full commission today. 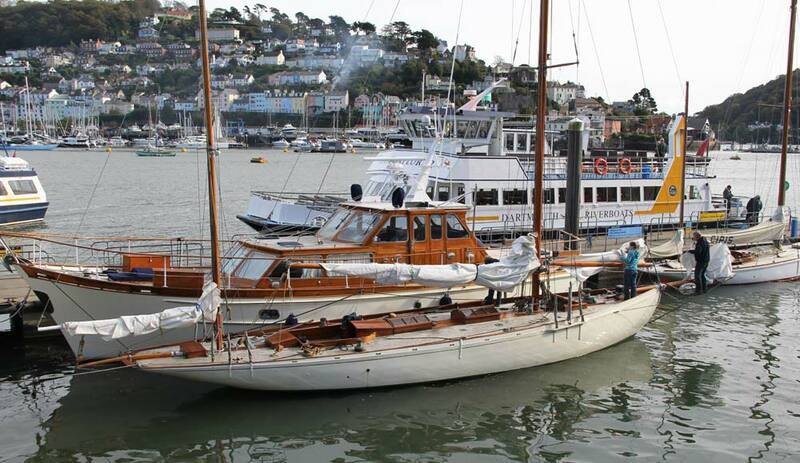 Currently undergoing further restoration in Dartmouth, Devon under the direction of Guy Cottam, she will back in the water in 2014. Saunterer is operated and managed by the Saunterer Trust. She was commissioned by Mr John Simpson on 20 October 1899 for “handing over on or before 31st day of March 1900”. She is 47ft 5 inches long overall, 38ft 2 inches at the waterline and weighs 16 tonnes. “Among the other competitors in the Solent small cruiser class is Saunterer, which, built this year as a fast cruiser, may be taken to represent Mr. Sibbick’s latest idea of a heavy displacement boat. We were interested to find that Saunterer does not differ much from the Sibbick 36-footer racing craft of this year in shape. She appears to be quite as flat on the floor, but is, of course, immensely strong, and heavily ballasted”. In 2014 Saunterer is one of very few Sibbick yachts still in full commission, and is in original condition following sympathetic maintenance and restoration throughout her long history. She has her original frames, hull and deck timbers from 1900 and her spars from the 1930s, and in 2010 had her original main hatch and companionway design reinstated. 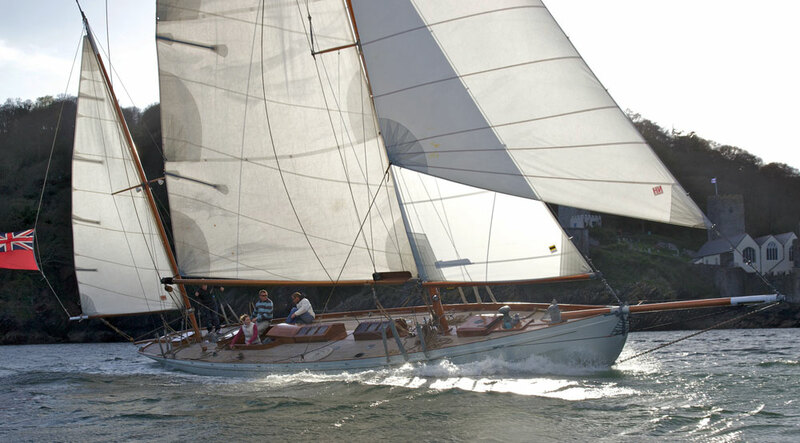 Saunterer is one of the oldest yachts sailing and racing on the South Coast of England. Saunterer was built by yacht designers and builders, Messrs C Sibbick & Co., of the Albert Yard, Cowes, Isle of Wight, England. 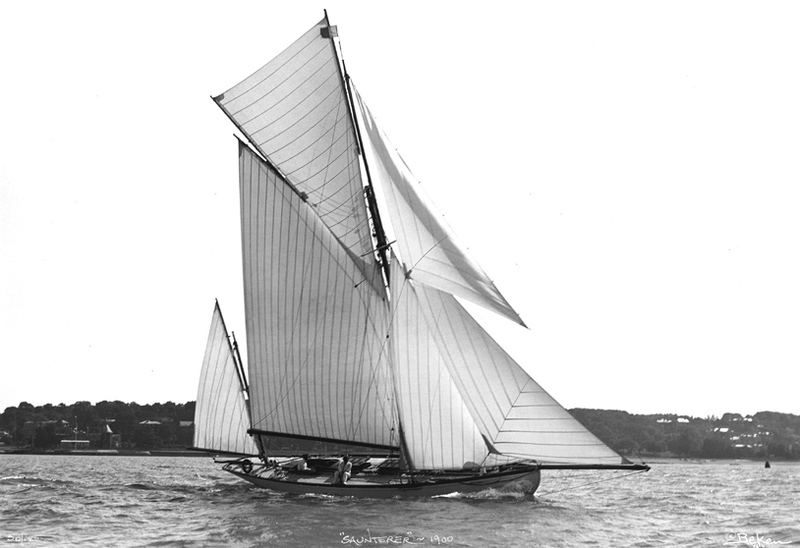 She was described as a “wooden yawl” with sails supplied by Ratsey & Lapthorne of Cowes. She was launched on 27 March 1900, and on 4 May 1900 she was unconditionally certified to Lloyds Classification 18 A1. John Simpson of Ty’r-afon, Hampton Wick London SW owned Saunterer from 1900 until about 1908 and during his ownership registered a racing flag for her. Saunterer was then sold to Captain L.E.G Oates of Gestingthorpe Hall, Castle Hedingham, Essex, whose various adventures on board he recalled during his ill-fated trip to Antarctica in 1911-1912. After his death on 16 March 1912 she was passed to his brother B.W.G Oates of Messing, Essex who owned her until 1918. 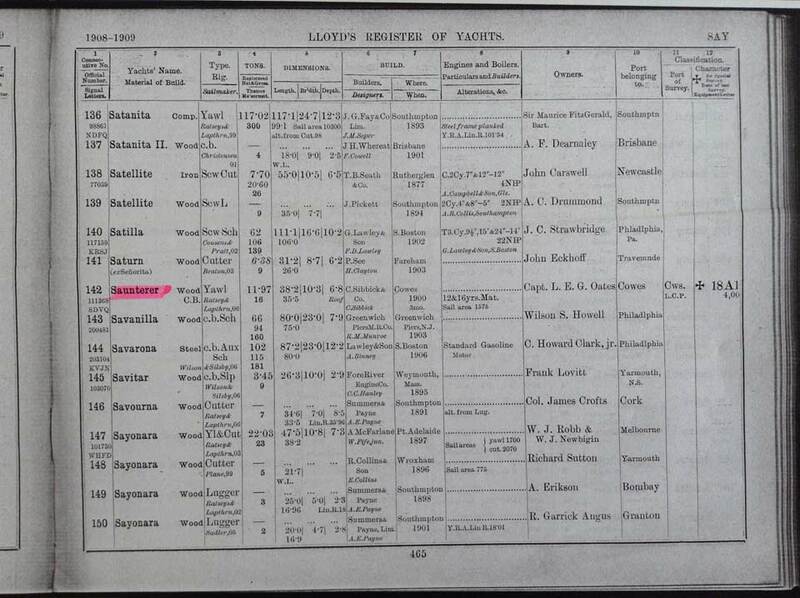 It was during Captain Oates’s time that Saunterer was withdrawn from the Lloyd’s Register of Yachts in January 1911. 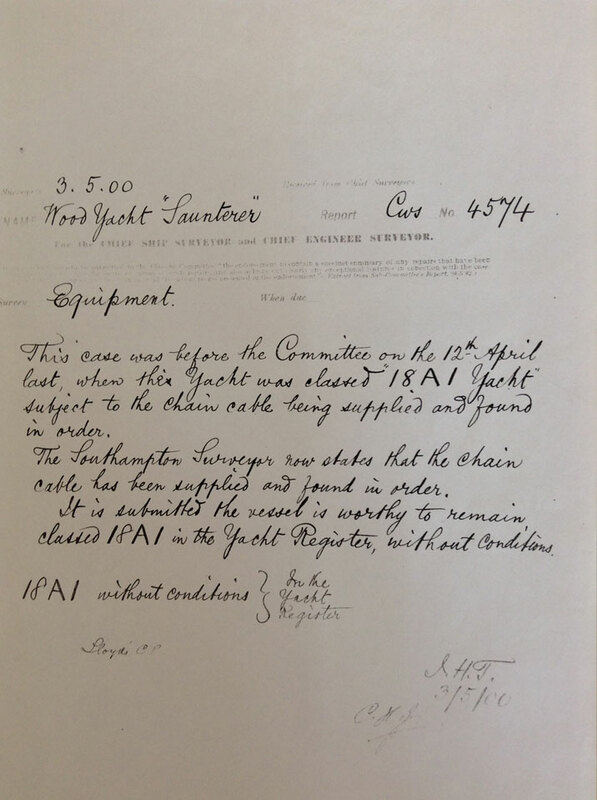 During WW1 Lloyd’s did not publish a register of yachts so the exact date of sale by the Oates family is not known. 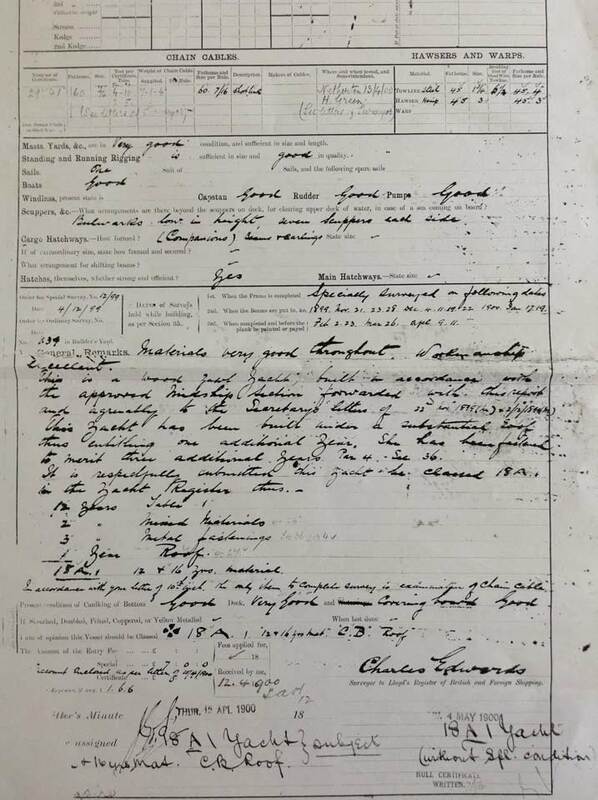 In the Register of 1919 her next owner was noted as Thomas Belt of Bigg Market, Newcastle-on-Tyne who was the proprietor of a rope and canvas business in Bigg Market. 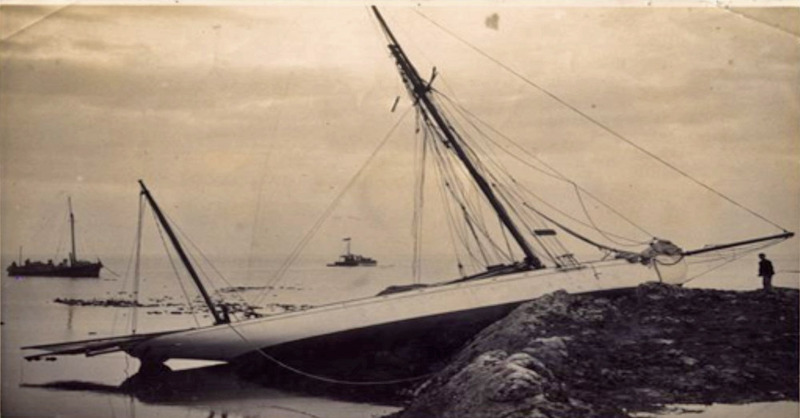 He had many mishaps and went aground on a number of occasions (including on the Kelpie rocks (below), with the Dunbar lifeboat waiting). He sailed her extensively until the Second World War when, once again, the Lloyd’s Register was not published. During this period her home port was Blyth in Northumberland. Saunterer next appears in the 1946 supplement to the 1939 register (having been sold in March 1944) where she is recorded as being owned by Major J. Pelham Kayll of 2, The Elms, Sunderland (a member of Sunderland Yacht Club and Royal Northumberland Yacht Club), his son Wing Commander Joseph R. Kayll, D.S.O., O.B.E., D.F.C. of Sunnyside, Waldridge Lane, Chester-le-Street, Co Durham (a Battle of Britain pilot) and David P. Kayll of Bovington Camp, Wareham, Dorset. Major Pelham Kyall was leader of County Durham Scout Movement and after his death Saunterer was owned by his son, Wing Commander Joe Kyall. A spitfire pilot, during the war Wing Commander Kyall was shot down in July 1941 and became a prisoner of war (see “Lost Voices of the Royal Air Force” by Max Arthur), and in 1943 he was put in charge of escape attempts at Stalag Luft 111, where their greatest success was The Wooden Horse (see also Daily Telegraph Obituaries, 21 March 2000). Saunterer was based at Sunderland Yacht Club during this period and at some point during the Second World War Saunterer was fitted with a Coventry Victor two cylinder petrol motor. Joe Kyall was a highly respected quiet man who was Commodore of the Sunderland Yacht Club and instrumental at the time in the building of a ‘new’ clubhouse. As well as being in military service, the Kayll Family were timber merchants. In 1960 Saunterer was sold to Alexander Sutherland, 34 St. George’s Crescent, Monkseaton, Whitley Bay. He brought her back into Lloyd’s Register in November 1971 to Class 100 A1 – at that time being the oldest vessel on the Register with this classification. She was sailed extensively by the Sutherland family (including cruising to the Baltic and the Kiel Canal) and also used as a charter vessel based in Scotland for a number of years. 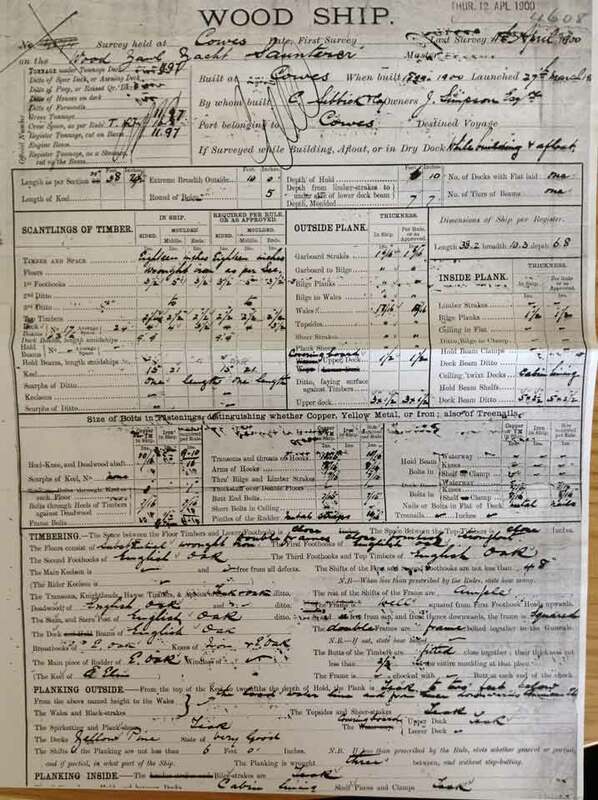 When Alexander Sutherland died the yacht was passed to Mrs E.B. Sutherland, 13 Eastfield Avenue, Monkseaton. However, this led to her being laid up, an incomplete survey and repairs required in November 1978. Her Lloyd’s classification was once again withdrawn in April 1980 and she has not been classified since. Throughout the period from WW2 Lloyd’s Register listed her home port as Cowes, but it is thought that she seldom visited the South Coast during that period. In 1973 Lloyd’s register shows her having sail number 407, which she retains to this day. In the early 2000’s she was launched again. After many years of reduced inactivity from the 1980′s, Saunterer was acquired in 2009 by Guy Cottam and Chloe Savage who moved her to the River Dart in Devon, and who between 2009 and 2012 carried out a very extensive and sympathetic restoration which brought her up to a very high standard while maintaining her authenticity as a unique classic yacht from the beginning of the 20th century. She was cruised and raced successfully from 2010 on the English South Coast, including visiting the Solent in June 2011. Saunterer went through a further phase of restoration in 2013/14 – including renewal of her chainplates for the first time since 1900 and some updating of her mast fittings and rig. The original gunter rig has been reinstated on her mizzen mast. She was relaunched in July 2014 in Dartmouth and sailed up to the Solent in August 2014. Saunterer participated in the successful 2014 Bart’s Bash weekend on the Beaulieu River and was based at Buckler’s Hard throughout the winter. On Easter Sunday, 6 April 2015, she returned to Dartmouth via Weymouth. In the summer and winter of 2015/16 her lead ballast keel was removed and refastened in March 2016 with new bronze floors and keel bolts, completing an important major phase of her restoration. In the winter of 2016/17 her original jib fore-triangle was reinstated, together with recaulking her original yellow pine deck, and casting and installation of new bronze stanchions and rigging points. In the 2017/18 restoration, her electrics were renewed and revised, her engine and engine controls updated including dual controls in the cockpit, along with the purchase of a 1930′s Falmouth-made clinker built pram dinghy. Her restoration work continues to be carried out by Guy Savage at Dart Haven Marina on the Dart in Devon – and under the two owners in the period from 2009 to 2018 will have focused on preserving Saunterer’s authenticity while also maintaining her high standard of overall condition for cruising and racing, and supporting her affiliated associations. Saunterer is of important UK maritime historical significance and has a long heritage. Her working life is now being built up for the benefit of charities and related organisations. In the most recent phase of her life Saunterer represents an innovative and active channel through which to raise awareness of charities and affiliated organisations of all types. Saunterer’s working life is operated and managed by The Saunterer Trust, which is centred on (a) promoting the maritime heritage of the United Kingdom, (b) supporting and expanding Saunterer’s constituency of related organisations and charities through raising awareness and wearing their flags at sea with permission, and (c) promoting visits to the vessel and building up The Saunterer Trust Archive. It is hoped that further affiliations will be developed with the Royal Dragoon Guards (Capt Oates’ regiment), the Sunderland Yacht Club, and other charities. She is entered in the The National Historic Ships Register, and the Register of British Ships. The Saunterer Trust is building up an existing archive of documents and photographs showing her unique history, comprising records and personal recollections of those who have connections with her, or who have known her or sailed in her, during her long life. The archive will be available in due course for private view by appointment. The Saunterer Trust would be grateful to receive any information regarding the history of Saunterer, in whatever format, so that this remarkable story may be maintained and developed, including any comments on the historic information set out in this website.